Shirokiya department store on Sakaisuji in Osaka. Tokyo based Shirokiya opened its first store in Osaka in Shinsaibashi 2-chome in 1903 (Meiji 36). 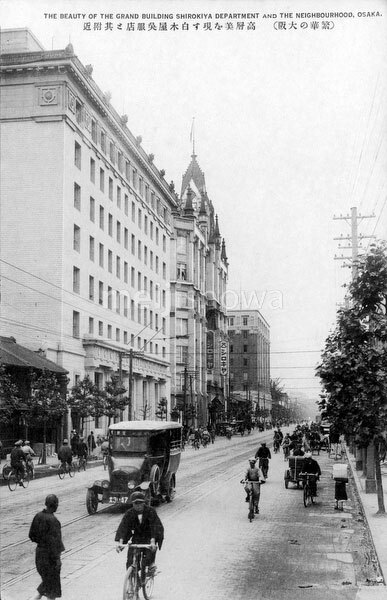 In 1921 (Taisho 10), it opened a nine story building on Sakaisuji, which had an important streetcar line. As a result Sakaisuji housed no less than four major department stores: Mitsukoshi in Kouraibashi, Shirokiya in Bingochou, Takashimaya in Nagahoribashi and Matsuzakaya in Nipponbashi. Hereby, Sakaisuji effectively replaced the centuries old Shinsaibashi as the most important shopping street in Osaka. Due to a business slump, Shirokiya left Osaka in 1932 (Showa 7). In December of that same year its Nihonbashi flagship in Tokyo was destroyed in a fire that caused 14 deaths.